NOVEMBER IS FAMILY LITERACY MONTH! Governor Patrick has declared November “Family Literacy Month” in Massachusetts. According the Shelley Quezada, consultant to the Massachusetts Board of Library Commissioners, family literacy programs address the intergenerational nature of literacy. Libraries may offer a family story hour where parents either participate (such as Mother Goose on the Loose, Baby Story times) or special programs involving family members? This may include programming such as family story, craft, puppet shows, book groups and/or film programs. Ventress Library is committed to promoting family literacy year round, but is planning a few special programs geared to this focus. On November 12, storyteller Jackson Gillman is doing his Rudyard Kipling “Just So” performance here at the library for an inter-generational audience. Handouts are available to take including “Why Read Aloud to Children” and “Literacy Begins at Home.” The Circulation librarian will fill the stack end-caps with literacy related books, some from the parent collection and others integrated in the adult non-fiction collection. The VML Classic Book Group choice this month is the adventure tale “Kon-Tiki” suitable for reading with young people with the companion film available to take out through OCLN on a library card. Children under 18 can sign up for a library card when a parent is present with an ID; those over 18 are eligible for their own card. So, come on into the library. Make literacy a priority for your family! Excerpts from literacy checklist for parents: For toddlers. . .”I read with my child every day even if it is just for a few minutes.” For pre-schoolers. . .”I help my child hear words that rhyme like moose, goose and caboose.” For kindergarteners. . .”My child can sound out some letters.” For first-graders. . .”My child predicts what will happen next in the story.” For second-graders. . . “My child reads for specific purposes and questions and explores topics of interest on his/her own.” For third-graders. . .”My child is starting to use metaphors and other literary forms in his/her writing.” For complete checklists, visit the VML Children’s Room and explore links on the library web and Facebook pages. The Friends group started “Treasures of the Ventress Vault” monthly silent book auction in 2009, the brainchild of Friend and Library Trustee Jean Christensen. It has proved to be very popular with patrons and a low-key fundraiser for the VML Friends. November has a very special offering – a large hardcover book, “The Earth From Above”, filled with stunning color aerial photos from around the globe. Would make a fine holiday gift under the tree. Place your bids at the Reference Desk today! The Old Colony Library Network Overdrive system now has e-books available for the Amazon Kindle. Just go to http://ebooks.ocln.org and click on the Kindle to search for e-books you can download to your computer and device. The library’s weekly blog will soon be featuring a Teen pick in addition to its regular dose of new books, reviews, and readalikes. The blog is written by the Head of Circulation Services Amy Boivin and can be found under What Do I Read Next? on the library’s homepage www.ventresslibrary.org. Suggestions are also always welcome and highly appreciated. Also become a fan of the library’s Facebook page and receive weekly updates on children’s and adult programs, new books, and other library tidbits. There are lots of things going on in the children’s room this November in addition to our regular weekly story times and book clubs. We’re beginning the month with the always popular Music and Me program, presented by teachers from the South Shore Conservatory. The program will take place on Friday, November 4th at 10:30 a.m. and is geared to children age 0-4 and their caregivers. Space is limited and sign up will begin in the children’s room on Monday, October 24th in the children’s room. Every family can be a musical family! Come in with your little one and join in the fun. On Saturday November 12th at 10 a.m. the library will host story teller Jackson Gillman who will perform The Magic of Rudyard Kipling: “Just So.” This fantastic inter - generational program is for the young and the young at heart, and is appropriate for children age 5 and up and adults. Come celebrate family literacy month and enjoy some timeless stories with your family. Space is limited for this program. Please pick up your free tickets beginning on Monday, October 31st in the children’s room. Last but not least, singer/guitarist, Mama Steph will be here on Saturday, November 26th at 10:30 to perform for pre-schoolers and their caregivers. No registration is necessary to attend. As always, check the white board in the children’s room and the children’s page on our website: www.ventresslibrary.org to see all of the events going on for kids at the library! Life Long Learning Program Off to a Good Start! The Ventress Library has partnered with the Council on Aging and the Historic Winslow House to offer life long learning classes for adults. The program, called “Opportunities”, kicked off in Spring 2011 with a variety of classes including “History of WWII”, “Folk Art”, “Maritime History of the South Shore”, “Stress Relief”, “Walking a Labyrinth” and “Sketching on the North River.” Fall classes now in session include “Math Made Easy”, “Computer Boot Camp”, “History of Classical Music” and “Lighthouses.” Plans are underway to offer even more classes in Spring 2012. Watch in the library, on-line and in the newspapers for more information on upcoming programs and opportunities to sign up for classes. Life long learning is alive and well in Marshfield – catch the wave and take a class! The library loves to receive your used book donations, but please, don’t leave your book boxes outside at the mercy of the elements. Bring your books in good condition into the library Circulation Desk and we will store them safely to sell. Books the library cannot use, such as old encyclopedias and cookbooks, videocassettes, textbooks and books in poor condition, can be placed inside the “Got Books” bin in the library parking lot. 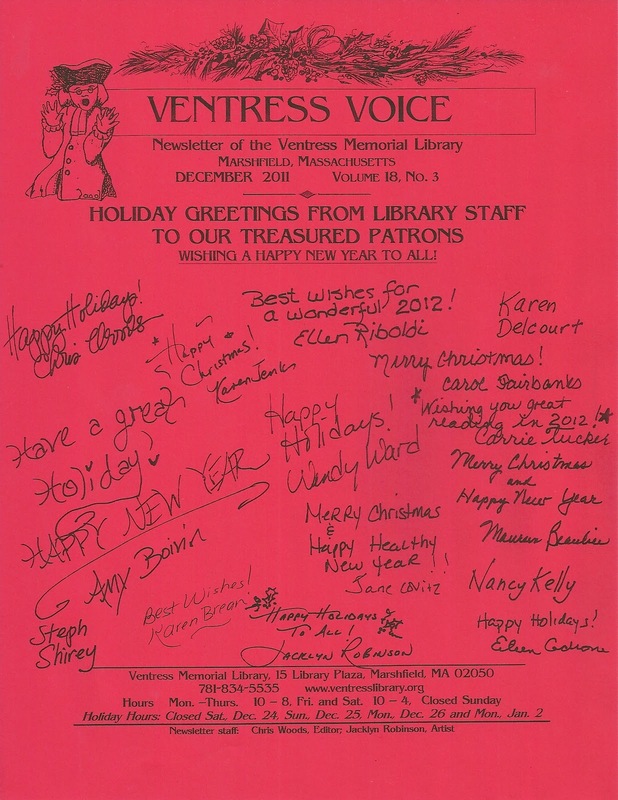 Recently I was in the Historical Room doing research and I happened upon a notebook that contained back issues of the dormant “Ventress Voice” library newsletter. The newsletter made its appearance in December 1991 as a way to spread library news to patrons and other OCLN libraries in the age before computers and Internet were readily available. As I flipped through the back issues, memories flooded the room. The first issue was lovingly crafted on a Mac plus by a stay-at-home mom with a library degree in a cramped home office tucked inside a double-doored closet. When nap time was over, so was work time, and the doors would close until the next few snatched moments of editorial bliss. In these first issues, an exuberant Town Crier proclaimed from the masthead and news articles reflected the concerns of a different time. Some examples of stories included: “no new cards added to paper card catalogue since May 1991 – try our new electronic catalog to find your books;” “Boston Globe now available for searching in the library on CD-ROM;” troll dolls, a fundraiser by VML Friends, sport “I love the Ventress” outfits; ways to play library Jeopardy; and a list of suggestions how to carve out time to read a good book. Each issue unfolded both milestones and minutiae in library history that captivated this reader. With the demise of the “Voice”, library updates took place on-line through our website. But, in striving to keep up to date, we lose the old content that has been replaced by the new. I approached Library Director Ellen Riboldi with the idea of bringing back the “Ventress Voice” while still maintaining website updates. Reverting to the older format would provide patrons with a paper copy of library news and events today, and a record of what went on for future researchers who “happen upon” back issues in the library’s Historical Room. She enthusiastically assented, and this renewal issue began. The former stay-at-home mom, who is now Head of Reference Services at the Ventress Memorial Library, has come full circle. Now, shall we bring back that Town Crier logo. . .? Speaking of getting the word out, who wants to be on the radio? Station Director Ed Perry and his daughter Katherine are looking to spread the word about how great our local libraries are with their “Love Your Library” testimonial campaign. If you have a story about how the library has influenced you in a positive way, contact Library Director Ellen Riboldi at 781-834-5535 or malib@ocln.org. You can be interviewed either in the library or go to the radio station to record a 30-second slot for airing. Step up and spread the word about what your library means to you. And, be famous on the radio!!! MP3-CDs –Something New in the Audiobook Section! Do you enjoy listening to books on CD but find that keeping track of multiples discs can be a bit frustrating---especially while listening in your car? Well, Recorded Books, the provider of our Books on CD titles has come up with an ingenious solution. It’s called an MP3-Cd and it’s the answer to a commuter’s dream. An MP3-CD is a disc that contains compressed audio files. The average audiobook is usually recorded on about eight compact discs. This same audiobook may be contained within one MP3-CD. MP3-CDs are played in the same way as standard CDs. In computers, the CD/DVD drive is already set to accept MP3-CDs. Newer automobiles (those manufactured after 2006) are equipped with CD players that are MP3 compatible. We think you will love having only one disc to handle, rather than 8, 9 or 10! There’s no need to switch discs while driving. You will have a more enjoyable listening experience and a much safer trip! New Museum Pass at the Library! The Ventress Memorial Library now offers a museum pass for the USS Constitution Museum in Boston. The pass covers up to 9 people and includes free admission. Come check it out. The Ventress Memorial Library’s Facebook page is up and running. Weekly updates are posted on the page and are administered by the Head of Circulation Services Amy Boivin and Children’s Librarian Wendy Ward. Go to the library’s homepage and be a Facebook fan of the library! Also the library has a weekly blog of new books, reviews, and readalikes. This blog is updated weekly and written by Amy Boivin. Suggestions are always welcome. The blog can be found under “What Do I Read Next?” on the library’s homepage www.ventresslibrary.org. Fashion Class for Teens—A Hit! From the Fashion Runway to the Fashion Rack: A Fashion Class for Teens ran four classes over the summer. The classes were taught by fashion designer Amanda Bartlett and hosted by Head of Circulation Services Amy Boivin. The classes involved answering the question ‘how does a fabulous dress make it from a simple pencil sketch to hitting the floors of Nordstrom?’ and learning what the steps are and how to create a fashion illustration. The age range was 12 to 17 years old and participants had to attend all four classes. This program had a great turnout and the results of the teens’ sketches were amazing. They all did such great work and the designer had wonderful things to say about all of the participants. Check back for sample pictures of the teens’ final work. Fall Story Times will begin the week of September 18, 2011. We are offering 3 different story times: 1. Tales for Tots: Infants – 3 years old with a parent or guardian on Tuesdays, Wednesdays, or Thursdays at 10:30 a.m. 2. Story Time: 3-4 year olds on their own on Mondays at 10:30 a.m. and 3. Story Craft: 5-7 year olds on their own on Thursdays at 2:00 p.m The only story time requiring registration is Story Craft. Registration for Story Craft begins on Monday, September 12, 2011 in the Children’s Room. Check out our new Children’s Department blogs: The Children’s Corner Blog and the Kid’s Book Group Blog on the children’s section of our webpage at: www.ventresslibrary.org. Also, be sure to check out our webpage periodically for information on special children’s events and performers. You’ve been asking and we listened – Consumer Reports is here on the Ventress Library website. The library purchased a license to allow our patrons to access the Consumer Reports product database from our website (www.ventresslibrary.org) using your library card number as your key. Now you can search 24/7 for the valuable information you need before making a product purchase. Includes complete graphs, charts and content of the print edition as well as added website content. In these tight financial times it is more important than ever to make savvy purchase decisions. Enjoy!